Purple-sprouting broccoli tastes sweet and is so good for you. It arrives when we really need it – at the brighter end of winter when we’re dying for new ingredients. I steam it as you would asparagus, standing with the heads out of the water. You may need to trim the stalks (they dry out quickly) but don’t remove the leaves. Trim the broccoli and steam until just tender (4–5 minutes). Slice the mozzarella into rounds, or tear into chunks. Drain the anchovies. Gently heat the oil in a small frying pan. Add the garlic and chilli and cook for a few minutes until the garlic is very pale gold. Add the anchovies and press with the back of a wooden spoon to break them up (they melt into a sauce). 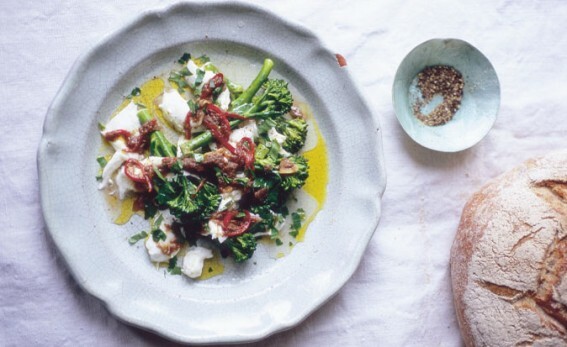 Put the hot broccoli on plates and top with the mozzarella. Add the lemon juice, pepper and parsley to the anchovy oil and spoon over. Drizzle with more oil, grind on more pepper and serve. As a side dish omit the mozzarella and halve the amount of anchovies. Very good with roast lamb. With cumin, chilli, mint and yogurt Heat 6 tbsp groundnut oil in a wok. Add 700g (1lb 9oz) trimmed broccoli. Stir-fry for a few minutes. Add 3 tsp cumin seeds, 2 red chillies, deseeded and very finely sliced, and 3 garlic cloves, finely sliced. Cook for 2 minutes, tossing. Splash in some water, season, cover and cook on low heat for a minute, until just tender. Drizzle with plain yogurt and chopped mint. With ginger, chilli and soy Stir-fry as above, but add fresh root ginger, peeled and grated, to the chillies and garlic and omit the cumin. Replace the water with sherry. Splash on soy sauce at the end and let it bubble away to glaze. With ricotta, lemon, olive oil and Parmesan Steam 450g (1lb) broccoli until just tender. Divide between plates and quickly top with 125g (4 ½oz) ricotta cheese, broken into chunks, the finely grated zest of 1 lemon and the juice of ½, salt and pepper, a really generous slug of extra virgin olive oil and 50–75g (1½–2oz) Parmesan cheese, shaved.